The first series of Tales of the Unexpected was aired in 1979 and all of the episodes are based on short stories written by Roald Dahl. Some of the stories, such as “The Landlady” and “Neck”, are very sinister. Others swing more towards the comical. Most of them have a twist ending and all of them are very worth watching. They are Dahl’s stories, so it is only fitting that play host to the show and introduce each episode. 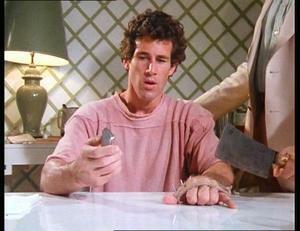 After the introductory music has finished Dahl is shown sitting in a chair, with a writing board in front of him, and he delivers a short talk about the upcoming story. Most of the later series lack his presence, and the majority of the stories used in them were penned by other writers. 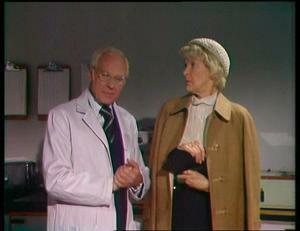 Dahl’s supply of stories ran short in series two. So it is arguable the later episodes were created as a way of cashing-in on a winning formula. 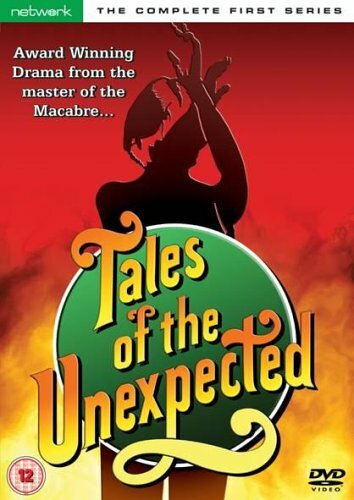 The first series of Tales of the Unexpected set the standard. The stories used in the later series are good, but series one is arguable the best. The first tale is called “Man from the South”. Pamela Stevenson co-stars and the story is set in Jamaica, where an old man proposes a bet to a young American. The old man likes to bet and he wants a good bet—good, big bet and if he loses he will give the American his car. All the American needs to do is get his cigarette lighter to light ten times in a row. Of course, if his lighter fails to light—just once—he will lose, but nothing, the old man tells him, that he cannot afford to lose. Just the little finger of his left hand. The old man will—”chop-chop”—chop it off. “Mrs Bixby and the Colonel’s Coat” stars Michael Hordern and Julie Harris (who you might remember as Eleanor from the 1963 film The Haunting). This one is not as dark as some of the other tales of the unexpected, but it does have a surprise ending, and rather an amusing one at that. Mr Bixby is a New York dentist and for the last four years his wife has been faithfully visiting her ailing aunt once a month. Or so she tells him. In reality she has been the weekends with her lover—the Colonel. 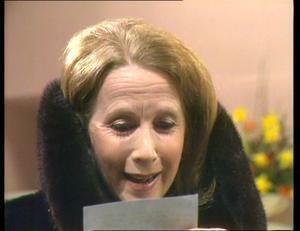 The Colonel has decided to call things off though, and he gives her an expensive mink coat as a parting gift. 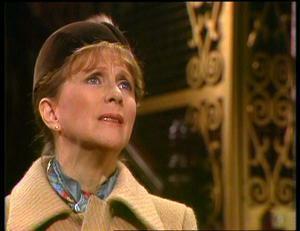 Mrs Bixby loves the coat, but is faced with somewhat of a dilemma: what will she tell her husband? She can hardly say her aunt could afford to lavish such an expensive gift on her. In the end Mrs Bixby comes up with quite a clever plan to ensure she will be able to keep the coat, but avoid all of the questions. “William and Mary” is a strange little tale. Elaine Stritch plays Mary,who is the widow of a college professor. By the sounds of it she didn’t have much of a life when her husband was still around. He had very strict opinions about things like smoking and it was strictly forbidden. William is dead and Mary’s has got the fags out. When Mary gets a mysterious letter from one of her husband’s associates though, she discovers that her old man had some rather strange ideas about how he wanted to spend his afterlife. “William and Mary” is a very strange story. It’s also rather amusing and should appeal to anyone who has a dark sense of humour. “Lamb to the Slaughter” is a story of betrayal and revenge. The story saw its first on-screen adaptation in an episode of Alfred Hitchcock Presents, with Barbara Belle Geddes (Miss Ellie from Dallas) starring as the loving wife with a dead husband sprawled across the living room floor. 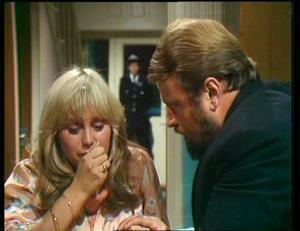 I actually prefer the Tales of the Unexpected version, with Susan George playing the wife and Brian Blessed as one of the detectives who arrives to investigate her husband’s murder. The detective and the dead man were colleagues, so the grieving widow decides he and the other officers may as well stay and eat the dead man’s lunch—a nice leg of lamb. This episode is a little darker than “William and Mary”, but the humour is still there and the way the murder weapon is disposed off is rather clever. “The Landlady” is one of Dahl’s darker tales and one of the scariest things about it is—and Dahl states this in his introduction—the events in the story could easily happen in real life. Thankfully, finding a landlady like the one in this story is very unlikely. A young man takes the train to Bath where he is due to start a new job. He makes a snap decision and instead of booking in at the hotel recommended to him he takes a cheap room at a guest house run by an unusually friendly, if somewhat strange, old lady. The man signs the guest book and notices he is the only guest and nobody appears to have stayed there for quite some time. Some of the names in the book seem strangely familiar as well, but he can’t remember why. By the time he has settled in, had a cup of tea, and found out about the landlady’s strange hobby, it is too late. This one truly is a tale of the unexpected and it is one of my favourites from the series. 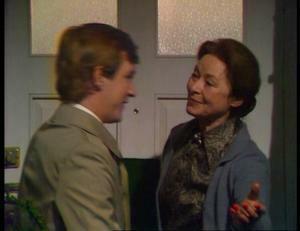 “Neck” is another of my favourite episodes and it has quite an impressive cast which includes Michael Aldridge, Joan Collins, Peter Bowles and Sir John Gielgud. 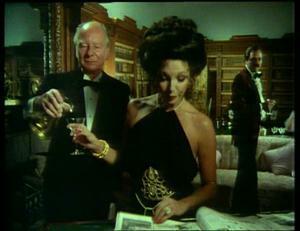 After his father’s death Sir Basil Thaunton inherited a media empire, was suddenly considered quite the catch, and it was the lovely Natalia (Joan Collins) who caught him. Sir Basil’s main passion in life is art though, and he is a ferocious collector. When Sir Basil invites a young man down to his estate for the weekend Natlia takes an instant shine to the young man, much to the disdain of Sir Basil’s faithful and incredibly perceptive butler, Jelks (John Gielgud). “Edward the Conqueror” is the strange story of what happens between an old married couple—Edward and Louisa—when a stray cat turns up at their door. 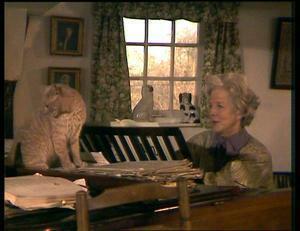 Music-loving Louisa becomes convinced the cat contains the reincarnated soul of the composer Franz Liszt. Edward is not so easily convinced and soon develops a real dislike for their feline house guest. Faced with a situation where he feel is authority is being questioned, Edward decides to take action. So, while Louisa is in the kitchen preparing a nice meal for her honoured guest, Edward is out in the garden stoking up the bonfire. Needless to say, this is a story that does not have a happy ending. 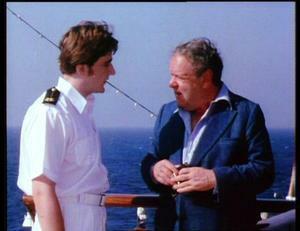 “A Dip in the Pool” stars Jack Weston as William Botibol, a passenger on a luxury cruise ship. Each evening the ship has a lottery and the person who comes closest to predicting the ships mileage for that day wins a substantial cash prize. Mr Botibol intends to win that money and he is willing to go to quite extraordinary lengths to make sure of it. This is a story of greed. It also shows what can happen if you put your faith in the wrong person. “A Dip in the Poll” is also strangely amusing, in a dark sort of way. Although “Botibol” is a strange name, the character in this story does not appear to be the same person as the one in “Mr Botibol’s First Love” (Tales of the Unexpected Series 2). “The Way up to Heaven” is a rather nasty, and very entertaining, tale about a lady who hates to be late. Whenever Mrs Foster starts to worry about being late;f—r anything at all—she starts to panic and her right eye begins to twitch. To make matters worse for the old girl, her husband seems to delight in deliberately holding her up and ensuring she is late. In the end though, this is one worm that turns, and Mrs Foster, who is sick and tired of being delayed, leaves her husband behind, takes a taxi to the airport, and then flies to Paris to see her daughter and grandchildren. As you can proably guess, her actions have some unexpected consequences. The complete first series of Tales of the Unexpected is available on DVD, but a Blu-ray option was not available at the time of this review.